And it's not even Sunday. The yarn is from the fabulous Scout and was a part of her first Indie Yarn Club thingy. The yarn is a yummy wool bamboo blend that was a joy to work with. The colorway is called Punk Pink (black-silver-pinks) and was an exclusive to the club. I used US 1 rosewood dpns for this pair of man socks with my usual short row heels and toes and 2x2 ribbing. They were knit cuff down and are even cooler in person. Long time readers/lurkers will remember this yarn from past whiny posts about pooling and my general confusion over what to do and how to make it work. 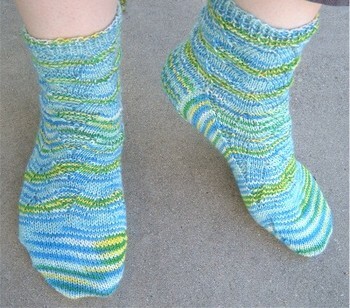 I'm sure you're all thrilled to see that I did actually make socks out of the yarn in the end. Pattern: My usual 2x2 rib short row toe and heel socks. Yarn: Cookie by Scout. Superwash wool. Needles: US1 rosewood dpns. Love! Knit for: What's his name, who is daddy to the little princess kittypaws. Time Served: About a week. Again? : Of course! The pattern is my old standby and the yarn is lovely. This will be my last pair of socks until the Summer of Socks starts. I've got three lace projects whining for attention and attention they will get. Even if it's not exactly the attention they were hoping for. Yes, Icarus, I'm looking at you! Is there a record for the most times Icarus has been frogged and reknit? Don't tell me. With my luck, it's me. I realized yesterday that I need to rip back a bit of the red lace and it's knit-on edging. I really do need to follow the pattern since I've never done the knit-on edging thingy before. However, I didn't want to do it, so I did what any sock/lace knitter would do. This is my usual 2x2 rib sock knit with US 1 rosewood dpns. Very short in the cuff because, in theory, the socks will go live with what's his name. The colorway is Cookie and comes from the fabulous Scout. Today is laundry, lace ripping and maybe giving the cat a pedicure. Y'all should be used to the weirdness by now. It's been two years. This past Sunday morning, there was an e-mail from Scout waiting for me. While not exactly awake yet, I opened it because it was from Scout. She wanted to know what my dream yarn colorway was and told me not to ask any questions. It's Scout. I know better than to question. I told her about a colorway that I had been wishing for and secretly thinking I may have to dye my own self (at some point in the future) to ever get. We e-mailed back and forth before she wandered off to play with her dye pots. The photo is pretty close. Scout will take better photos after she's dyed more of this colorway. It turns out that my Bev asked Scout to dye some yarn for me as a thank you for the socks I'd knit for her. She is such a thoughtful sweetheart. The yarn itself is superwash and I'm not sure if I want socks or a scarf. Not sure how the yellow would look against my skin. Right now, I am basking in the happy.